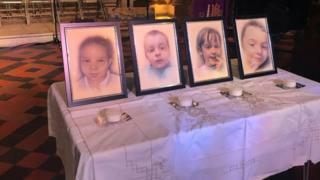 A memorial service honouring four young siblings killed in a house fire has heard moving tributes to the children. Riley Holt, eight, Keegan Unitt, six, Tilly Rose Unitt, four, and Olly Unitt, three, all died in Stafford on 5 February. Up to 300 people dressed in bright colours gathered at St Mary's Collegiate Church in Stafford. The children's school choirs sang and tributes were read by their head teachers. Up to 30 members of the children's family were in attendance. Rev Philip Sowerbutts told the memorial service: "We want to remember them in a hopeful and life-affirming way, to celebrate their short lives." Paying tribute to Keegan, Kim Ellis, the head of Marshlands School, said he was "cheeky" boy, who loved football and cars. "He touched the hearts of everyone who came into contact with his endearing smile," she said. 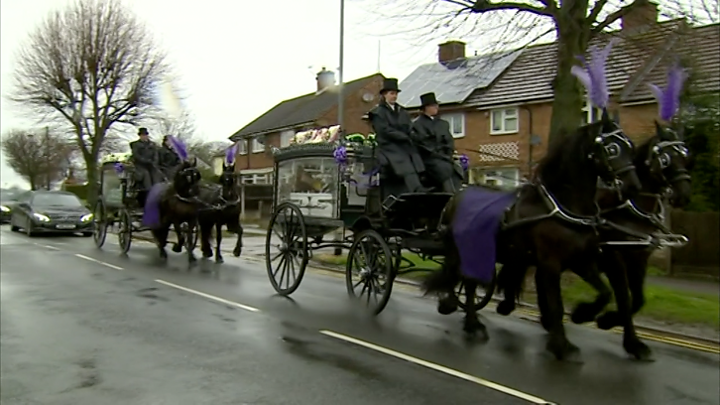 While head teacher Nicola Glover paid her respects to the three other children, who attended Castlechurch School. Speaking of Olly, she said he was "happy" at nursery and enjoyed singing. "You knew if he was enjoying an activity as Olly would poke his little tongue out in deep concentration," she said. She said Tilly Rose was very "helpful and absolutely loved the camera." "She saw everything as an opportunity to jump in front of it and have her photo taken," she said. Ms Glover said of Riley: "Whether this was singing, dancing or playing with his friends, Riley was someone who liked to get involved." An inquest was told it is "yet to be ascertained" how the children died. The cause of the fire is not yet known, however Staffordshire Police previously ruled out an exploding boiler and cannabis growth . A 24-year-old woman and a man, 28, who were arrested on suspicion of manslaughter by gross negligence, have been released while inquiries continue. The children's mother, Natalie Unitt, and her partner, Chris Moulton, survived the fire along with the siblings' two-year-old brother, Jack.